It's hard to gauge who the most popular star in the world is, and by all accounts, that person is probably from India, not Hollywood. But there is no denying that Brad Pitt is one of the biggest names on the planet. And you'd expect that he'd turn more of a profit at the box office. But as it turns out, a new study shows he's the least profitable star in Hollywood. He's not alone. A few other big name actors failed to turn a pretty penny when it came to their movies over the last thirty years. 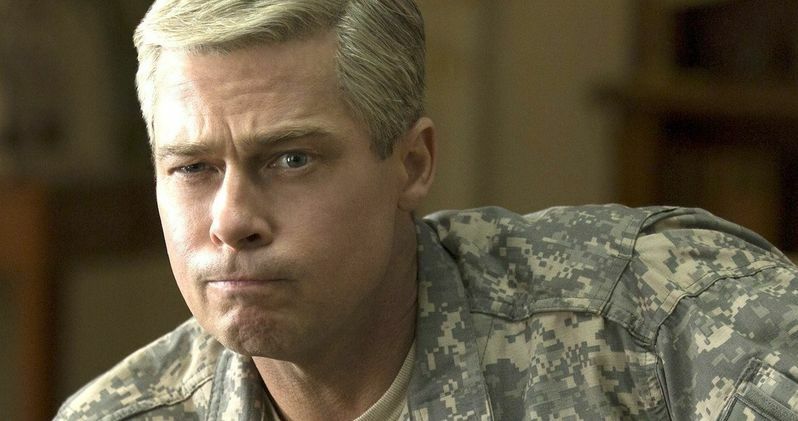 Analysts from PartyCasino, a unit of the GVC gaming group, have done an intensive break down and study, which proves that Brad Pitt only brings in ten cents for every dollar spent on one of his movies. Coming in behind him is Johnny Depp, who only manages to pull in twenty cents for every dollar. Robert De Niro fares a little better, with twenty-four cents. And surprisingly, Hugh Jackman, who's final Wolverine movie Logan proved to be one of this year's biggest and most well-received blockbusters, can only cough up twenty-five cents for every dollar spent. Anthony Hopkins trails behind, pulling in twenty-six cents, which isn't great until you compare him to Brad Pitt. While Brad Pitt is supposed to be one of the most bankable names in the entertainment industry, he's had way more misses than hits. And one would be hard pressed to even remember the last time he had a substantial hit at the box office. He last appeared in Netflix's War Machine, which premiered on the streaming service. And before that, he was one of the ensemble players in the Oscar-nominated The Big Short, but while well-received by critics, that movie didn't necessarily tear it up at the box office. Brad Pitt's biggest movie to date is World War Z, released in 2013, which brought in $202 million. Second on the list is Mr. & Mrs. Smith, which debuted in 2005 to the tune of $186.3 million. But it's been awhile since the guy set the box office ablaze. Out of the 42 movies where he's served as a lead, only 11 of those have broken $100 million during their initial run in theaters. Perhaps most surprising about PartyCasino's list is the guys who proved to be the most profitable. Believe it or not Emilio Estevez, who hasn't starred in a movie since 2010's The Way, is the most profitable star in Hollywood, pulling in $6.70 at the box office for every $1 spent on one of his movies. The reason for this is that he was paid substantially lower than Brad Pitt and Johnny Depp during his heyday, with the study stretching from 1980 to 2017. The star of Young Guns and The Mighty Ducks had the best return out of any top-billed male actor who has headlined at least 10 movies over the past thirty some years. Second on the list is Jean-Claude Van Damme, who makes $4.20 for each dollar. Mel Gibson is next in line, making $3.50 for every dollar. The most prolific of the group in terms of our modern cinematic landscape is Tyler Perry, who has Boo! 2 in theaters starting this Friday. He earns $3 for every dollar. Tying with him is Dudley Moore, who passed away in 2002. The data analyzed left a lot of actresses in the dust for the sole fact that leading ladies are rare in Hollywood. But it was a woman who outshines Emilio Estevez when it comes to turning a profit. Believe it or not, Rose Byrne scored a high profibility margin of $9.80 for every dollar spent. Which basically means she's not taking home a very big paycheck compared to her male co-stars. Regina Hall is in second place for the women with $3.50 for every $1 spent, and Octavia Spencer brings in $2.90. Here's how The New York Post breaks down the method behind this madness. "Researchers took each movie's gross from Box Office Mojo, which tracks receipts from theaters in the US and Canada, and subtracted each movie's budget. The difference, dubbed "profit" by analysts, was then divided by each movie's budget to determine its ROI, or return on investment." When it comes to genres, mysteries proved to be the most profitable, returning $39.89 for every dollar spent. Horror was next in line, especially after the year the genre had in 2017. Horror movies generally make $34.13 for every dollar spent. Where do superhero movies fall into this? Well, they are being lumped into the action genre, which proved to be the least profitable by a long shot, pulling in just $1.89 for every budgeted dollar spent. After looking at this least, can we suggest that someone replace Brad Pitt with Emilion Estevez in World War Z 2? Now that's a movie we'd see in a heartbeat.